FutureGuard Window Awning 3700 Custom Canvas Co.
"Makers of Fine Awnings and Boat Covers"
For information on our fine products or email. 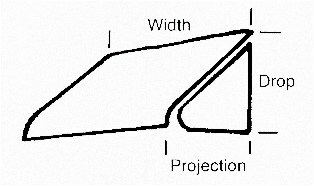 Custom widths in 1" increments, price to next largest size. This unit does not fit casement windows. Use Series 4300. Note: Verify all information before ordering! Call or email if you have questions before ordering. Protects windows and furnishings from direct rays of sun and elements. Reduce summer cooling cost. Bronze finish framework will never rust. Available in over 50 fabric patterns and colors. Adds beauty and value to your home. Includes all necessary hardware for quick and easy installation. Available in any width up to 240" in one piece in 1 " increments. Available in over 50 fabric patterns and colors. up to 36" 46" 56" 66" 76"
Projection 16" 18" 24" 28" 33"
Drop 20" 23" 28" 32" 37"
Measure window height (A). Select Awning Model #4 for windows up to 36", #5 for up to 46", #6 for up to 56", #7 for up to 66", and #8 for up to 76". 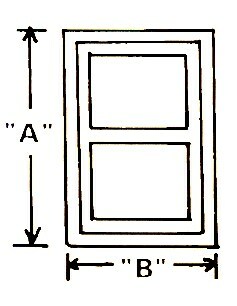 If mounting on casing, measure outside width of window casing (B). For wall mount, select any desired width. Arms can not be mounted on shutters. Custom widths up to 240" in 1" increments. Select the color(s) and pattern choice that best compliments your home. All awning framework is in bronze finish. See color selection. Note: Verify all information before ordering! Orders Are Not Returnable. Call or email if you have questions before ordering. Drop and projections are approximate and may be changed by moving arm mounting location. Prices include shipping by UPS - Excluding Alaska and Hawaii. Price also includes oversized orders shipped by truck if shipped to a business address, add $50.00 for oversized orders shipped to a residential address - Excluding Alaska and Hawaii. 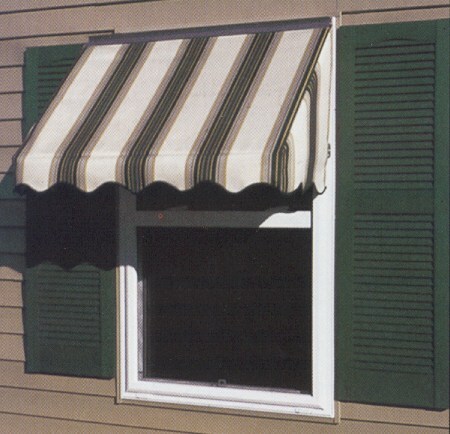 OVERSIZED AWNINGS wider than 84"
*FutureGuard, Dickson Fabrics and Sunbrells Glen Raven Mills, Inc. are registered trade marks of there respective companies. Custom Canvas Company is an independent reseller and in no other way affiliated. This page last updated 10/08/2014 . Copyright 2002 Custom Canvas Co.
Site created and maintained by Clem Systems.